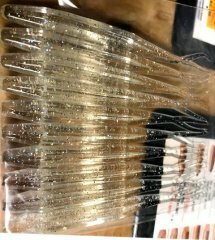 I use the BTS 5" stick bait molds and I wanted a way to do laminates while waiting for an actual laminate block or attempting dual injector w/ blend block. I needed a more precise way to shoot laminates without trusting my poor hand pouring skills. I'm a bit of a perfectionist sometimes and I just could not get the results I liked. Enter Reynold's Pitmaster's Choice heavy duty foil... I folded and creased the foil to cover one side of the mold and entrance hole and attempted my first laminate shot. The shot came out great! The idea worked. I removed the foil sections, closed up the mold and shot the second color. DISCO! We're in business. Now, I can shoot some laminates while waiting for my laminate block. Below are some I've done. The first is one I call Watermelon Slice and the other is the old reliable Red Shad. Btw, that red/pearl color is a pain. Something else to consider is the number of re-heats on the same plastic if you're doing multiple shots. Initial heat, Shoot baits, Re-heat, Shoot next round, Re-heat, Shoot another round, etc..etc... This can change colors (and plastic) a lot as the heat stabilizer begins to "wear off" after multiple reheats of the same plastic, especially if you're pushing the upper end of the temps each time. I've had this happen to my watermelon seed shots before. I added a bit of head stabilizer to my second re-heat (just a dash) and I've not had the issue happen again. I don't know if it was this that fixed it, but no more changes after multiple shots and re-heats on the same plastic. Folks, thank you all for the kind words. I really appreciate it. I'm going to attempt a laminate shoot later today... Happy New Year All! After many hours of research on this forum and watching hours of youtube videos, I finally shot my first soft plastics today. Rather than bring me a standard DIY starter kit, Santa took my list of items quite seriously and brought me just about everything I needed to begin my journey into making my own soft plastics. I'm an avid kayak bass fisherman, and being able to roll my own just makes sense for me. I've always found baits that will work, but I've always wished some were just a bit different. Now I have the means to do so, and I've had a blast today so far. I didn't get too crazy, but I wanted to shoot a bait I've wish I had for some time....a truly clear fluke with shad colored glitter(s). I came up with something that will do well on lakes I fish here in TX, but next time I will use a bit less large black flake. Thank you all for the tips, do's, dont's, and the plethora of knowledge and willingness to share. I truly appreciate it. My components and recipe: Do-it Wutz-it Forktail 5" 4-cavity mold Dead-on Plastix jerk bait formula - 1 cup (8oz) Black Flake .035 - 1 dash (~1/8th tsp) Blue(Navy) Flake .015 - 1 dash (~1/8th tsp) Purple Holographic Flake .015 - 1 dash (~1/8th tsp) Here is the link to the gallery with the results.